When decorating for a holiday, I love to use items I already own in a different way. I just look at what I have and do some free decorating. And since it is autumn, I guess you can call that “free falling.” That was my approach to our fall decorating this year. Since this is our first autumn in our new place, everything will look different anyway. 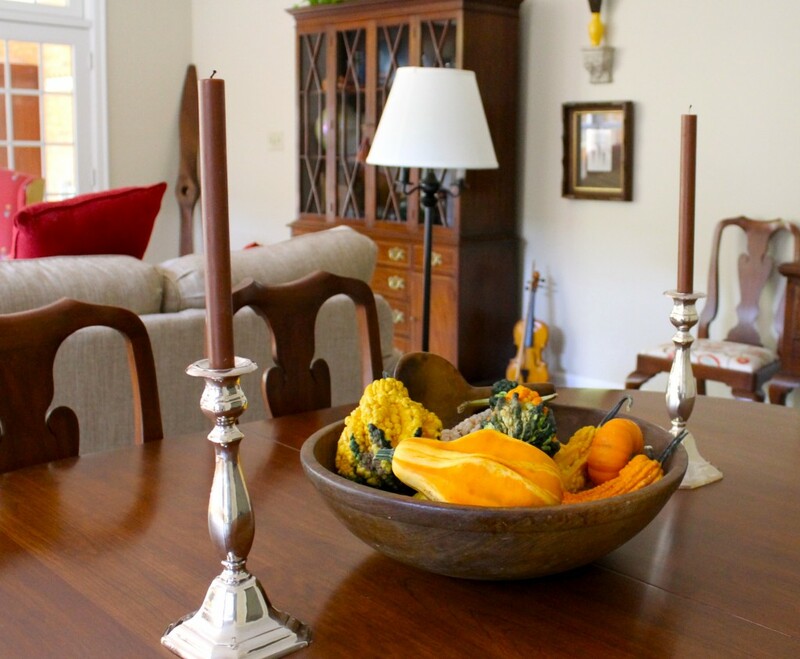 So, by just buying some fresh gourds, pumpkins, and some brown taper candles, I was able to create a very warm and inviting autumn look for almost free. I love a combination of shine and rustic, so, I got out one of my big old wooden bowls (free) and filled it with fresh gourds. 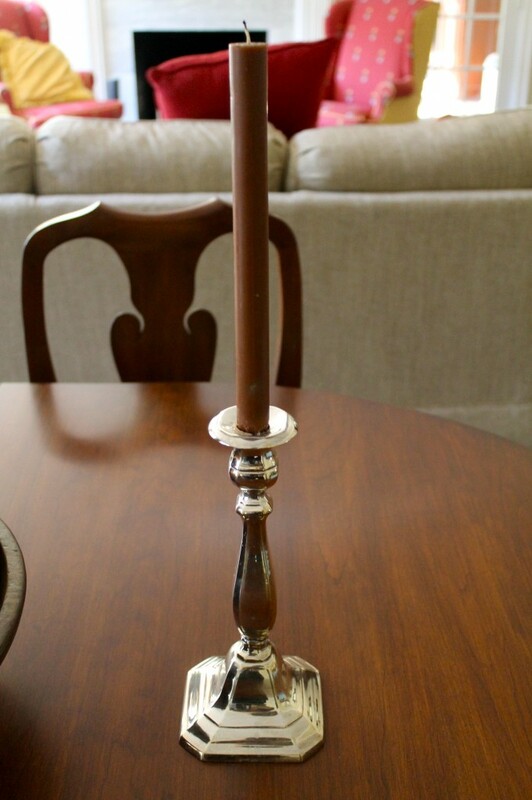 Then I shined up our great silver candle stick holders (free) and added some nice brown candles to them. 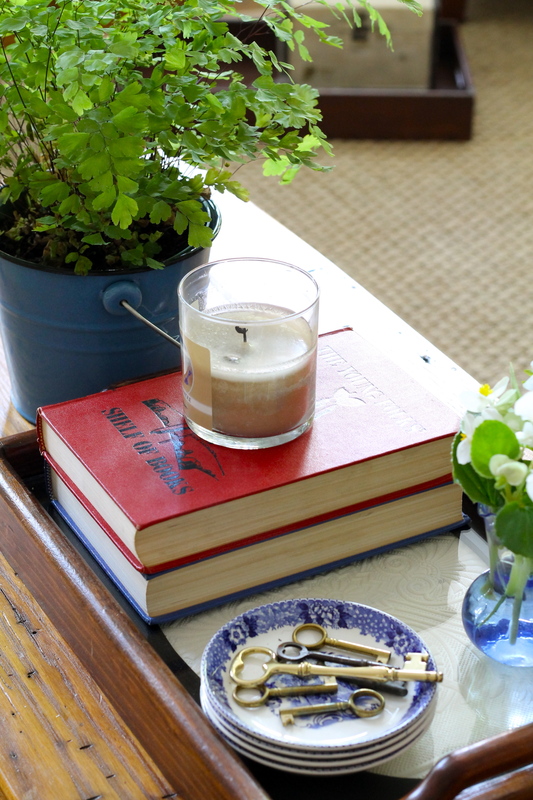 Instantly I had an easy, attractive, and cheap centerpiece for the dining room table. I love old wooden bowls and have several. They are great finds for a centerpiece like this or for serving a beautiful salad at a dinner party. 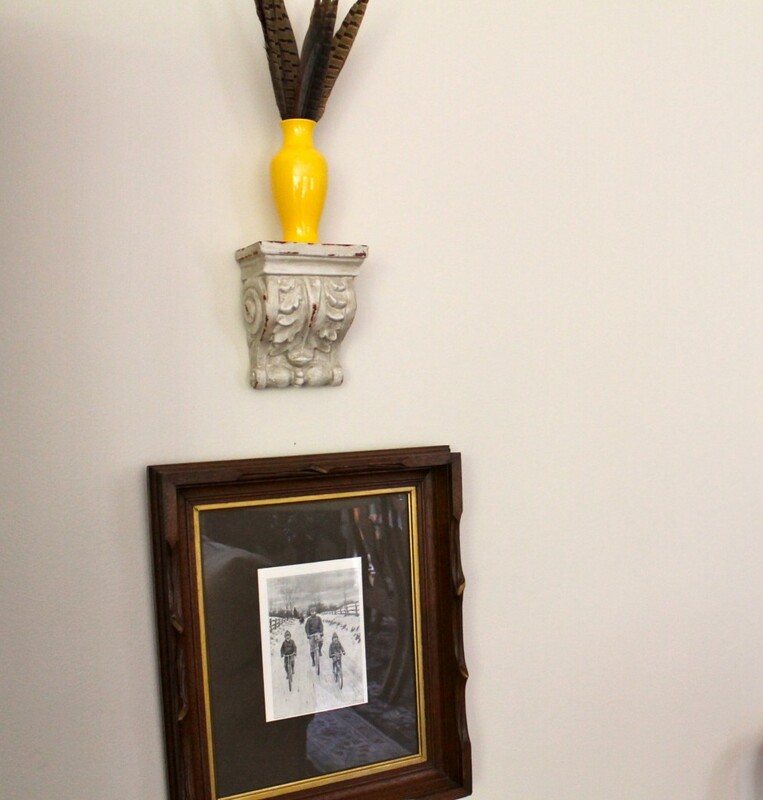 In another part of our great room, I use this little yellow vase (free) for seasonal color. In the summer I put fern fronds in it. Now that autumn is here, some of my pheasant feathers (free) bring in the fall colors. For Christmas I will fill it with evergreen and then switch to interesting small tree branches in the winter. I love its versatility! 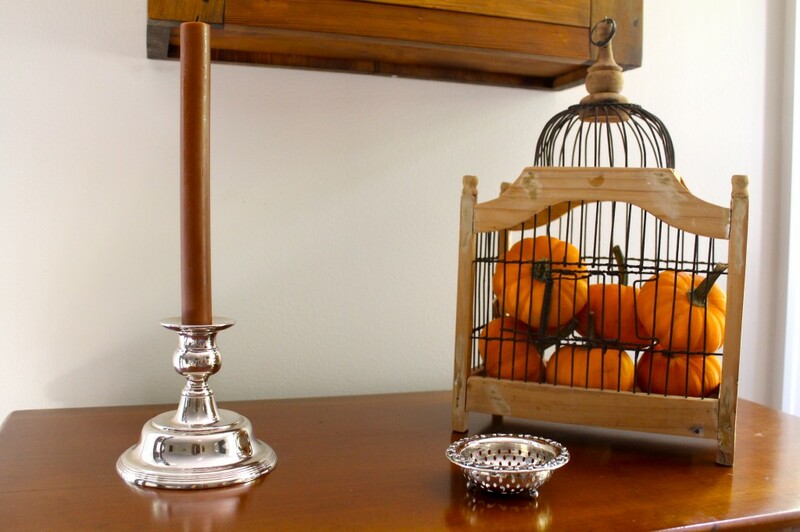 To continue my free falling, I added some fresh miniature pumpkins to this little wooden bird cage (free) and teamed it with a piece of antique silver (free)and added another brown candle to this small silver candle holder (free). Once again, I teamed rustic with silver and love how it looks. They sit atop an old sugar chest that I have had for years. 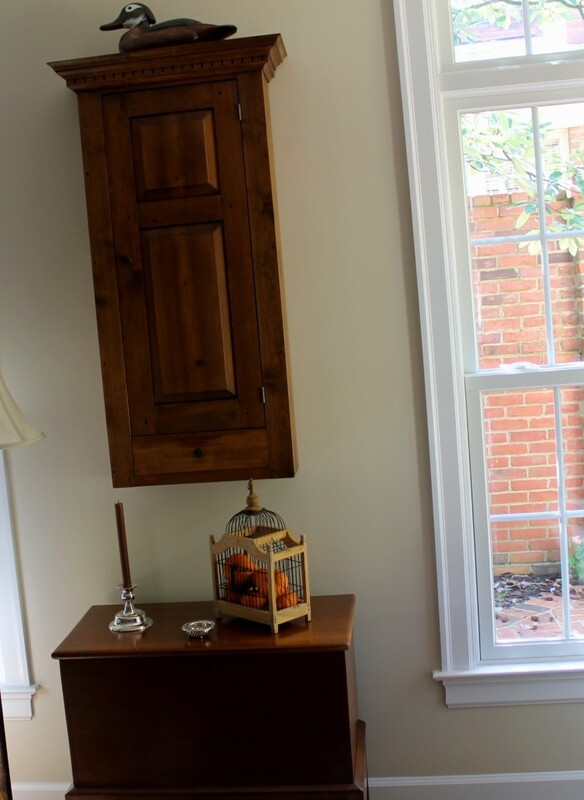 The cabinet on the wall is called a jelly cabinet. It was custom-made for me from wood taken from a building that was built in the 1800’s. I took the same “free falling” approach to the fall look in our sunroom. You can see what it looks like in the summer here. 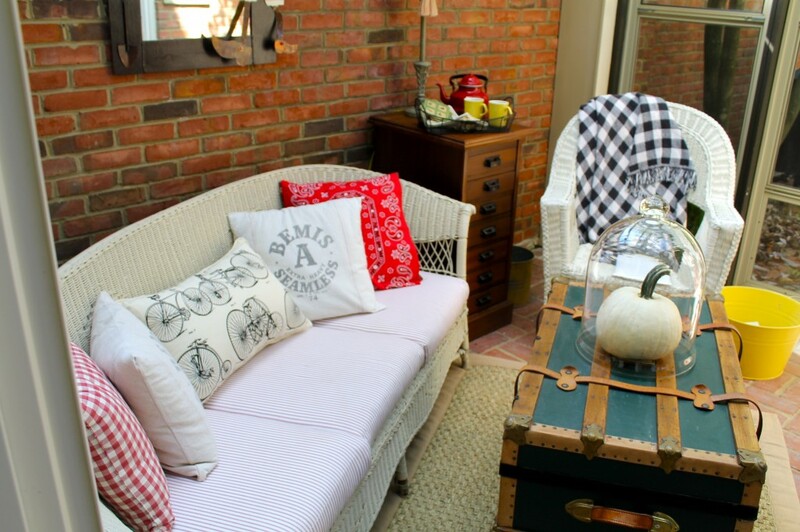 At our last house, I used a backwoods theme on our porch and plan to do that again in this house in our sunroom. I’ll ease into it, though. 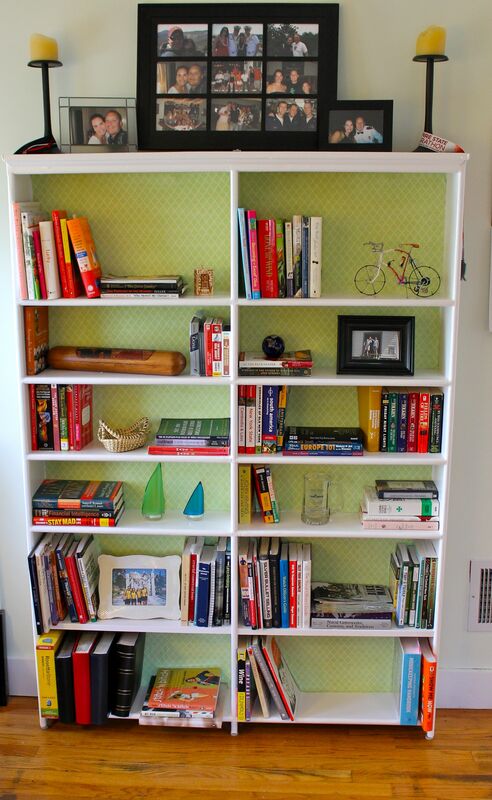 First, I removed the pastel rug and added a seagrass rug, which was one of two purchases I made for this room. That immediately set the mood. 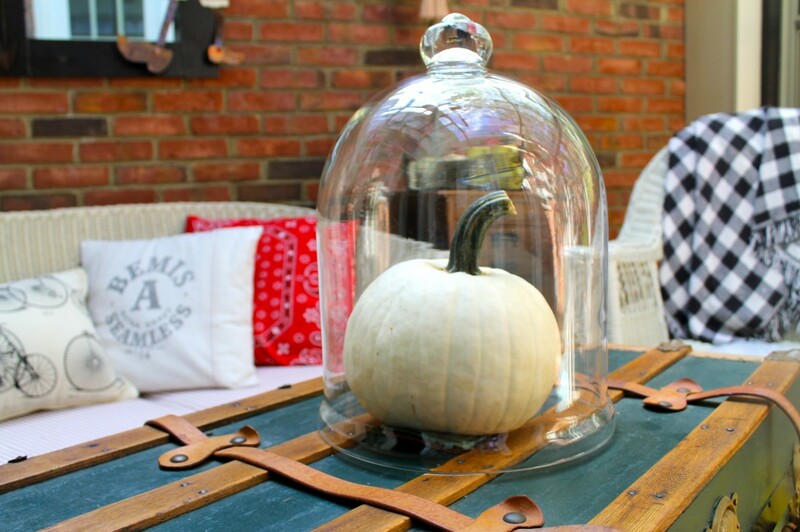 I put just one white pumpkin on the antique trunk/coffee table and covered it with a cloche (free). I removed the pastel pillows that were on the sofa and brought out some others I had stowed away (free). Then I bought this cute bicycle pillow at Home Goods which ties in perfectly with our love of cycling and with the antique high-rise bike we use as a sculpture in another part of the house. 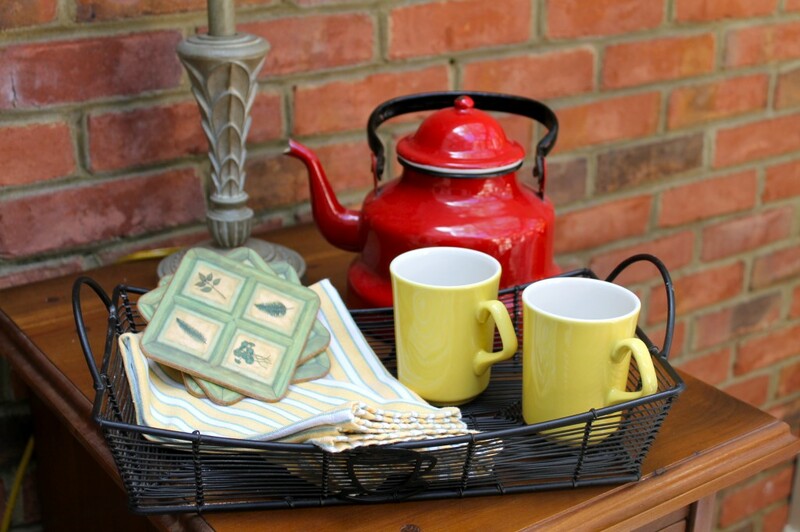 I made a little fall afternoon tea vignette using an old enamel tea pot (free) and other items (free) I had on hand. 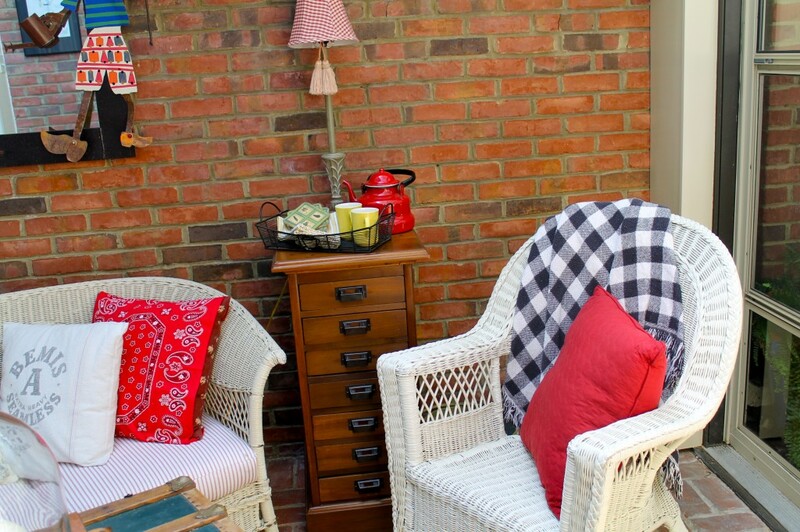 The last free thing I did to get a cozy fall look in our sunroom was to toss a black and white plaid throw (free) over the wicker chair and add another pillow (free). Even though it is fun to go shopping and buy some of the latest fall items for the home, I have a lot of fun just shopping the house and using what I have along with some creativity to set the mood. How about you. Have you done any “free falling” lately? Your home has certainly Fallen beautifully! Love the simple and pretty wooden bowl with the gourds! 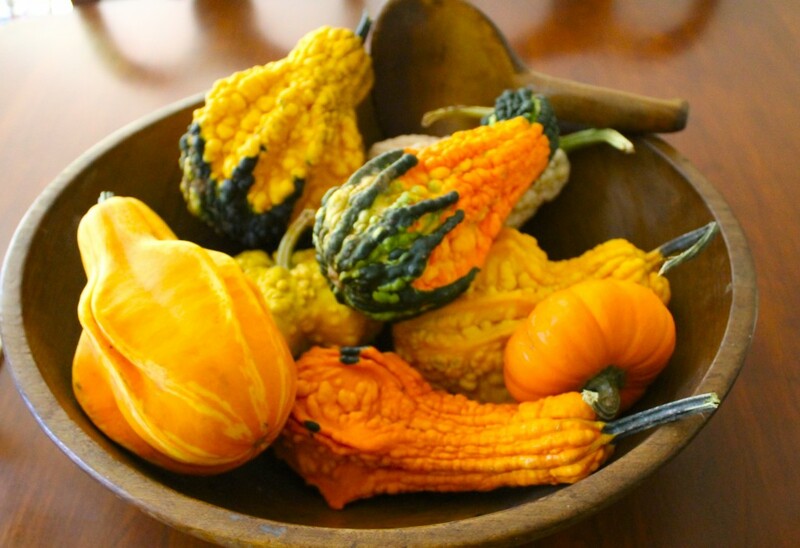 Those are gorgeous gourds too! Love all your Fallen touches and your sun room is so pretty. I love the little bike pillow! Your home is stunning. 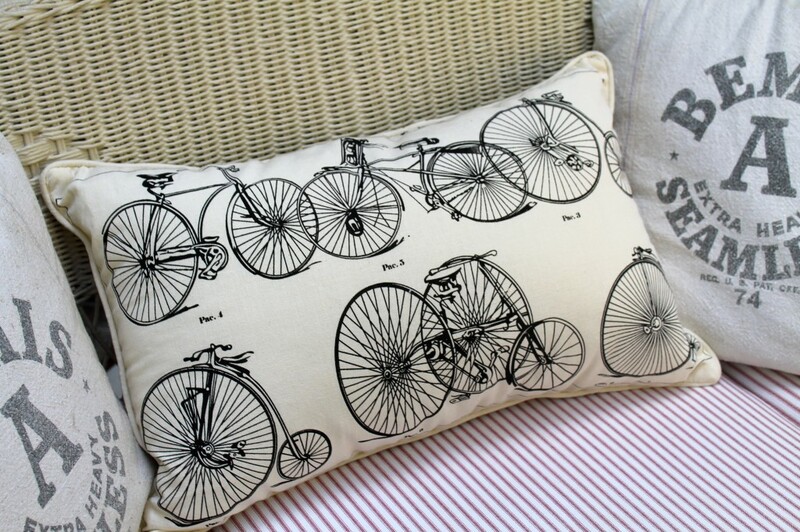 I love the new bicycle pillow…and all your Fall touches! Oh, I’m always free falling! Last year I grew some gourds, and they were all “free!” Didn’t get so lucky this year. I love your sunroom decor. I love Free Falling, shiny and rustic…can you send me that trunk ASAP! Love it! I love the way you have done your Fall decorating! I especially like the bird cage and wooden bowls they are so pretty.It is always so much fun decorating with the beautiful colors of Fall!! I absolutely love the caged pumpkins. So much inspiration. The yellow vase looks darling!! Everything looks great! Especially love the bird cage filled with mini pumpkins! 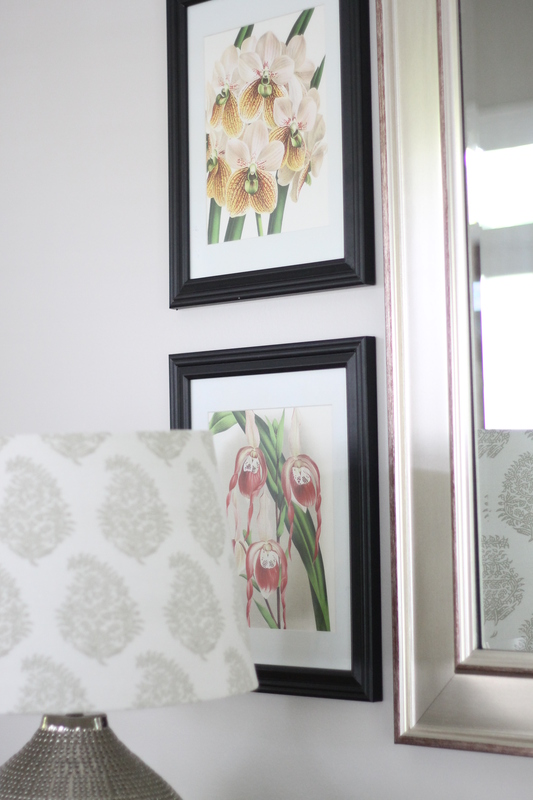 Your fall decor looks great! And I love your term free falling! Beautiful! It’s those little touches that add the warmth of the season. I’m eager to do some “free falling” myself. Thanks for the inspiration. I really like the simplicity of what you’ve done. I especially like the big wooden bowl (I have one, too) & the pumpkin under the cloche. Looks great! Lovely fall decor. Very simple but very nice. You have a very inviting sunroom.